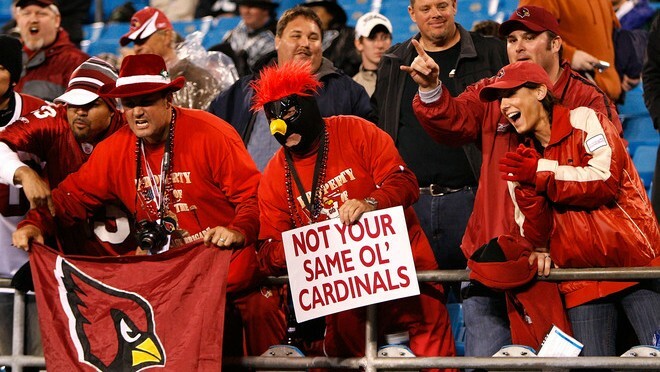 fanaddict: The NFL team with the most bandwagon fans: The Arizona Cardinals? The NFL team with the most bandwagon fans: The Arizona Cardinals? In the lull of the NFL offseason, you may have noticed a recent study conducted by Emory University regarding fan tendencies in professional American football. The study came in several parts, with fans reacting strongest to the ranking of fan bases—no surprises there. Claiming that their ranking was based off of factors of fan behavior, such as attendances, price of tickets and revenue, the Emory team released results collected over the past three years to a pretty familiar tune, featuring the blue-bloods and heavyweights as the best fan bases of the NFL. Cowboy Nation can claim supremacy over NFL fandom. Deflate-gate has not deflated the Mass-holes' enthusiasm for their regional English team. The Giants won the battle of New York, but not by much. And surprisingly, the Ravens came in at fourth. It's not terribly surprising how the Emory crew rounded out the top of their list since the teams have enjoyed recent success, multiple Super Bowl championships, and relatively modern, large stadiums. The surprises in the list come later, featuring the Cheeseheads and Steeler Nation at seven and fourteen, respectively. I was personally surprised to find the 12th Man of the Seattle Seahawks at an alarmingly low number 26 spot on the list. Given the new Nike jerseys, Beats and Oberto beef jerky sponsorships for Richard Sherman, the loudest open-air stadium in the league, and not to mention successive trips to the Super Bowl including the SB XLVIII win, the Seahawks still find themselves in the 26 spot. The defense to this ranking was that on average, Seahawks fans relatively do not spend as much money on their team as other fans do. I currently live in Seattle and I'll admit, I went from owning just a Marshawn Lynch jersey when he arrived in 2010 to a full wardrobe of Wilson, Sherman, Harvin and two Lynch jerseys since the team started winning the big games. But I'm not the only one. Wilson, Lynch, Sherman, Chancellor, Thomas III and now Jimmy Graham have all enjoyed extended periods of time on the NFL's top 25 selling jerseys, meaning that football fans in general are willing to spend at least $100 for one item of apparel for the Seahawks. The rise in jersey sales led me to two conclusions: A.) the true Seattle Seahawks fan base is relatively small and B.) there are most definitely Seahawks bandwagon fans, but they are not incorporated into the study, or else Seattle would be higher on this list. Perhaps this is a good thing since Emory is willing to scope out the true fan bases, but then again, not all fans can afford to go to games because of financial reasons and the stadium's natural capacity. Could this explain why the Cowboys that play in a stadium that seats 120,000 people have the "best fans" while the proud Raider Nation only comes in at number 30 because they play in the small O.co Coliseum? This led me to question the credibility of the Emory study regarding the aspects of fan culture that they used. Are the fan bases in the study divided between the real and bandwagon fans? And if so, did they get it right? As a former Arizonan, I didn't think much of the list cause at least it meant that Arizona Cardinals fans are better than Seattle Seahawks fans, right? Well not necessarily. While Emory was busy ranking all of the fan bases, they also took it upon themselves to find which team has the most bandwagon fans in the NFL. According to any sports fan you talk to, a bandwagon fan is someone who starts rooting for a team that has enjoyed recent success. According to their study, Arizona Cardinals "fans are most responsive to winning percentage in the NFL based on our [Emory's] statistical model of attendance." 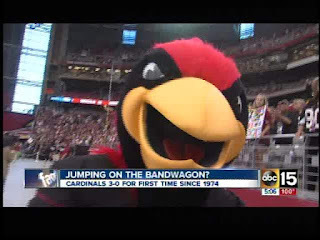 Upon reading a headline by CBSsports that a "Study says Arizona Cardinals have the most bandwagon fans in the NFL," I was honestly shocked. Recently before reading the aforementioned article, I saw a video on www.azcardinals.com titled "Arizona- Our State of Football." It is a pretty accurate crash course for anyone who is not familiar with the teams relatively short tenure in the desert which began in 1988, 90 years after the club's inception. Many people tend to forget that the Arizona/Phoenix Cardinals, previously the, St. Louis Cardinals, the Card-Pitt, and the Chicago Cardinals are the oldest professional football club in the NFL. But that is not why they have "bandwagon fans". For many, the Red Birds have the feel of a team that showed up late to the dance. For example, they were the last NFL team to join twitter and as a result, they have the fewest followers (191.4K followers). The futility in the hot Tempe sun at Sun Devil Stadium in the 90's was forgettable. The new team in the desert performed in front of essentially thousands of Cowboys fans that saw a mediocre St. Louis team lose week in and week out. 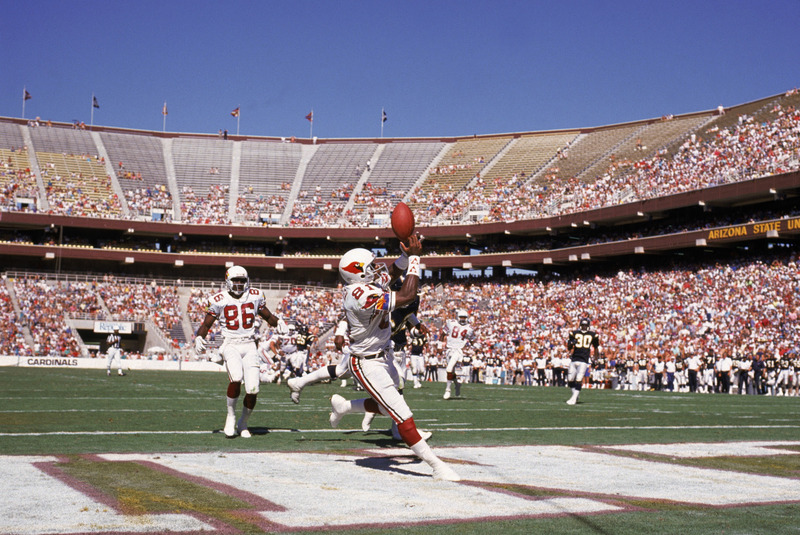 Because of 100+ degree heat, the Cardinals oftentimes had to resort to wearing their white uniforms, a slap in the face to the visiting Dallas Cowboys that couldn't wear their infamous white uniforms in front of masses of Cowboys fans at Sun Devil Stadium. Longtime Arizona Cardinals fans will always remember the playoff run that the team embarked on during the 1998 season which saw Jake "The Snake" Plummer, an ASU product, lead the team past the Dallas Cowboys in the old Cowboys stadium during the Wild-Card round of the playoffs. That's the furthest the team got into the postseason until the 2008 season. By 2008, the Cardinals were already settled into their new University of Phoenix Stadium which opened in 2006, abandoning a shabby horseshoe stadium owned by a mediocre state school that held 12 sellouts in 18 seasons for a spaceship-looking, air-conditioned modern architectural marvel that has holdout every American Football game it has hosted. 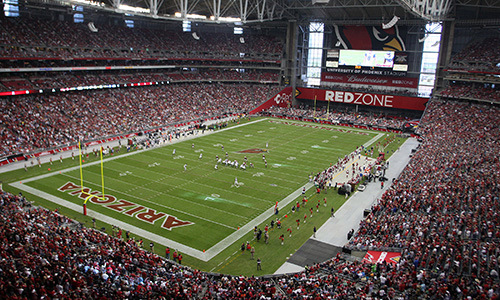 In terms of sellouts, the University of Phoenix Stadium has sold out every Cardinals' regular season game with an impressive streak of 92 games in a row, beginning with the first Cardinals game hosted at the stadium. Back to the Emory University study, the group mentioned that they based their rankings off of data that was mostly concerned with fan attendance to the responsiveness of winning and full stadiums. Considering that the Phoenix/Arizona Cardinals went 100-188 during their 18 seasons at Sun Devil Stadium with only 12 sellouts, it would be easy to draw a correlation between losing and poor attendance. However, it is important to look past the losing factor because that is not what drove Arizonans out of the stadium. Let me ask you a question: imagine that your favorite team did not play in your hometown, but a new team recently moved to town. The new team is quite mediocre and play during the same time as your favorite team in 100 degree heat in a suburb that is a pretty long drive from your home. So would you rather stay at home and watch your favorite team play on TV with your family for free or would you rather spend a whole day in the baking sun while forking over several hundred dollars to see a poor excuse of a professional team? When the Cardinals moved to their new stadium, they had been in the greater-Phoenix area for a generation. As a result, they brought a new uniform look featuring a mean cardinal mascot to the air-conditioned, indoor grass stadium for young, lifelong Cardinals fans. In typical Cardinals fashion, they christened the new stadium with a 5-11 record in the 2006 season, leading to the firing of head coach Dennis Green. The following season, new head coach Ken Whisenhunt chose to stick with the veteran quarterback Kurt Warner instead of the Matt Leinart. The decision turned out to be a winning move as Warner led the team to records of 8-8, 9-7 and 10-6 including a run to Super Bowl XLIII and one of the greatest postseason performances against the Green Bay Packers in the Wild-Card round of the 2009 season. But then again, what else would you expect from a future Hall-of-Fame quarterback? So how did the fans react? For starters, the rebranding of an angrier bird logo was a hit in the valley. With two iconic faces of the franchise in Larry Fitzgerald and Kurt Warner, many Cardinals fans bought their jerseys. Both of the players are true class acts and the Cardinals were blessed to have had them play together. Who could root against the unbelievably coordinated wide receiver who happens to be a single-father that donates $1000 to breast cancer research for every catch he makes in the month of October? What conservative Arizonan would root against a quarterback who loves Jesus more than football? Of course, the post-2006 Cardinals were not always peaches and cream, which brings forward the strongest argument against the Emory study. Kurt Warner definitely reinvigorated a mediocre franchise into winners, but when he did not start for the team, the team was it's usual wreck. In 2006, the Cardinals embarrassed themselves on Monday Night Football because "The Bears are who we thought they were!!" In 2010, a blow-out home loss on Monday Night Football to the rival 49ers was met with an agitated and repetitive, "That's fine" response by signal-caller Derek Anderson to the media. Two 5-11 seasons sandwiched a 27-21 regular season stretch, but you would not know it from looking at the capacity attendance attendance streak that remained intact at an impressive 40 home games. Without Warner, Whisenhunt struggled in his last three season with the Cardinals, going 5-11, 8-8, and 5-11 as he failed to find a suitable replacement. The losing ultimately cost him his job, making way for Bruce Arians, a longtime assistant coach that finally got his shot at the head coaching spot during an interim period with the Indianapolis Colts. Arians is no fluke as he has led the Cardinals to 10-6 and 11-5 records during his two years with the team. Today, the Cardinals are a team that has experienced a brief period of consistent winning, a sharp contrast from how the team played in years past. They no longer hold an element of surprise to opponents and fans alike; however, I do not believe that these winning ways provide evidence of bandwagon fans. Sure, the 100-188 record with 12 sellouts at Sun Devil Stadium is put to shame by the 71-73 record with 92 consecutive sellouts at the University of Phoenix Stadium; however, that does not take into account that the team has undergone some major changes in recent years. The Bidwell family made winning decisions by building the University of Phoenix Stadium, signing Kurt Warner, hiring and firing Coach Whisenhunt and hiring Bruce Arians and Steve Keim. These are important decisions for a Benjamin Button-esque franchise that has been around forever but is only now going through its formative years. So to address Emory, it is important to use data to measure fan tendencies; however, it is also important to understand and appreciate what it takes to win in the NFL and what makes the NFL the greatest American show on television. The move into an air-conditioned stadium undoubtedly helped raise attendance rates for the Cardinals, which just so happened when the team improved their talent. 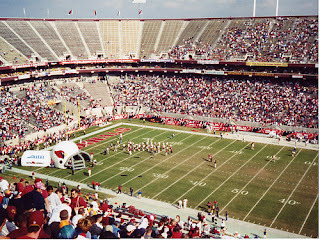 Lacking a high level of play in a few seasons at their new home, the Cardinals still managed to sell out 24 games when the team went a meager 5-11 for three seasons at the University of Phoenix Stadium. 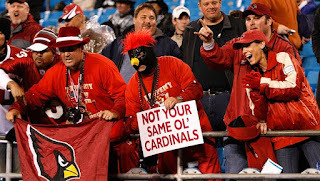 With the Red Sea guaranteed to make a full appearance in support of a greatly improved NFL franchise, these next few years will be the true indicators of whether or not more fans jump on the Cardinals bandwagon and if they in fact have the most bandwagon fans in the NFL.